For the third consecutive year, JR Race Car is sponsoring an excellent prize for the IHRA Summit SuperSeries. At the end of the season, the 2016 Summit SuperSeries Junior Dragster National Champion will receive a state-of-the-art, custom-built junior dragster. This year’s dragster will again feature a custom paint job by Jerron Settles of Imagine That Customs. The last two cars the company built for the Summit SuperSeries drew attention from drivers, both young and old, and raised the level of competition in the Junior Dragster division of the Summit SuperSeries even higher. What else would you expect from a company that has worked hard to support junior drag racing since its founding? In 1992, Chris Barth established JR Race Car in Fort Collins, Colorado, the day after the junior division was added to nationally-recognized drag racing competitions. Barth didn’t have a lot of space available to him at the start – “He was in a two-car garage,” says Kevin Horner, who works in sales for the company - but he wanted to construct top-quality vehicles for young drivers. Since those early days, JR Race Car has moved to a larger facility in Fort Collins, then to their present location in Greeley, Colorado. They build almost all their engines and components in-house from scratch - from pistons and rods to crankshafts and wheels. Last year’s car was built with their Hercules chassis and Stage 8 engine, outfitted with CNC ported intake and exhaust ports, 1.500” stainless steel intake valves and 1.250” steel exhaust valves. 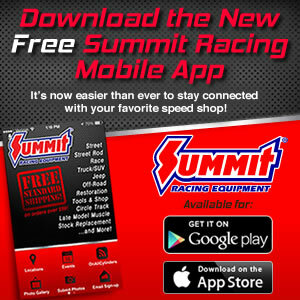 The Summit SuperSeries consists of 100 IHRA member tracks within regional IHRA divisions across the country. The competition is populated by Sportsman competitors, or ET Bracket Racers, who are the backbone of grassroots drag racing and compete in three classes: No Box, Box, and Junior Dragster. Each track crowns a Summit SuperSeries track champion who then moves on to race at the IHRA Summit World Finals for the Summit SuperSeries National Championship. In addition to the $3,000 cash grand prize from Summit Racing Equipment, the JR Race Car prize Junior Dragster is awarded to the Summit SuperSeries Junior National Champion at the World Finals in Memphis, Tennessee on October 21 – 23, 2016.